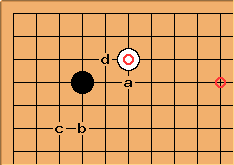 The plays a, b and c are often described as the best ways to respond to the marked white stone, especially in handicap games. 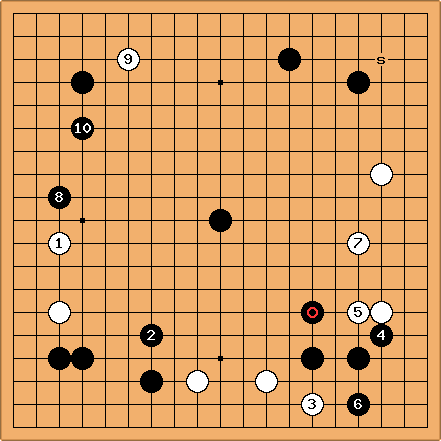 While a might be the most secure play, it strengthens the white stone. At b is better for influence and c is better for quick territory. 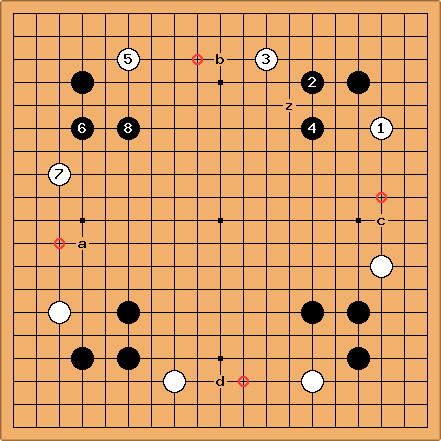 tderz: Don't forget response d. In positions where a Black top side hoshi is present (H6, H8 & H9 games + black checking attacks with then white double kakari), Black d makes White heavy after White a, then Black b (or sometimes c) and White cannot make preferred 3-ken extensions. 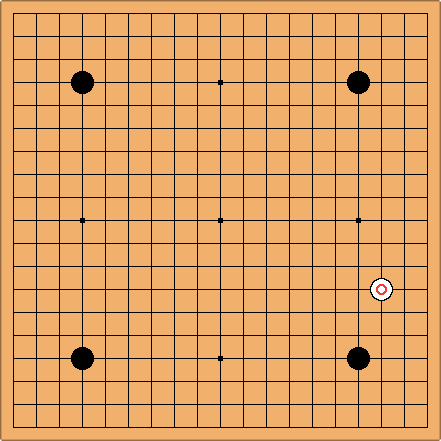 AvatarDJFlux 3k: But c doesn't guarantee any territory at all: having played the marked stone, White can still invade at san-san. A play at c is just more solid and less attacking than b. 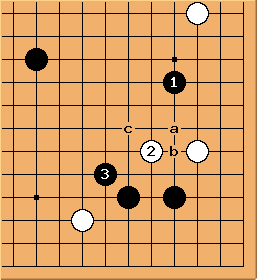 The choice is a matter of taste and of the surrounding position: if White has a strong position down the left side I would prefer to play the more solid c, rather than b. 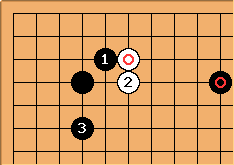 You may also consider playing a pincer to the left of White's kakari. But how to choose the answer in terms of whole board strategy? 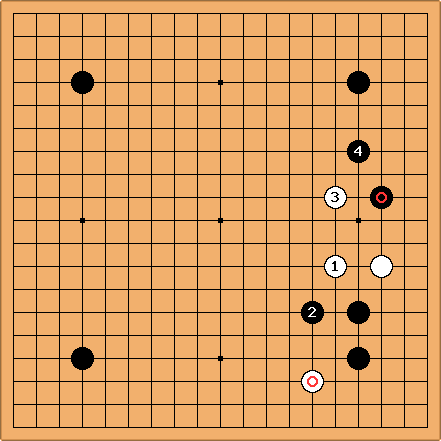 I (217.230.20.209) recently played this (Diagram 2) following local joseki and the proverb that it is never wrong to respond to kakari. But was I correct with respect for the whole board? What are the next big points for Black? FilipVanderstappen 5D: I think and are bad. They are just too "soft", i.e. easy on white. There is no need to lead these groups out into the center. Rather strengthen them by attacking the weak white formation: i.e. at C or 1 above . And surely should split the white position at the top. Attack rather than defend. and lose the initiative and lose points perhaps without you noticing. It is essential in 4 stone games to attack early and keep white weak. The moves are not outright bad in their own right, but are soft. This makes it very difficult to spot that they are actually very bad in this position. use your strength to make W suffer. Thisnis not an easy concept. Should you want more elucidation, just let me know. AvatarDJFlux 3k: I do not see anything wrong with your play. It may lack some forcefulness (again, you could have considered playing hasami instead of and ) but it is very solid: all your groups are strong, with their heads high and free in the center. On the other hand, White is overstretched all around: if she now defends, say at a, it's time to harvest the fruit of the strength you have patiently gathered: you start slicing White's extensions in half, say at b, c or d. You're in for a lot of fun%%% That's why White probably won't defend at all, but will keep playing attacking moves in order to scare you and not to give you time to counterattack! Bill Spight: is a little inefficient. z is usual. But your play has the effect of driving a wedge between White's stones to keep them weak and vulnerable to attack. The current position is really juicy for Black. Any of the circled points is a good play. Go get 'em! tderz: dia. 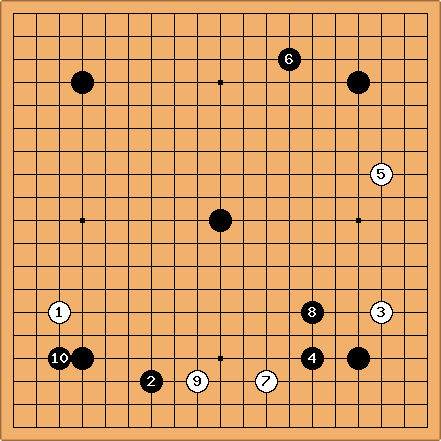 : This is the game of Fujisawa Shuko at 5 stones vs. Shusai Meijin. Shuko was 11 years old, Shusai 54. It was played on January 13, 1937. The source is "Masterpieces of handicap Go", Vol. 1, p. 1. "Here Black should invade on the right side". Perhaps it can be called more precise "Black should split White on the right side". This is in short what Filip explained above (split white). "Attack early!" by "separating the opponents stones". 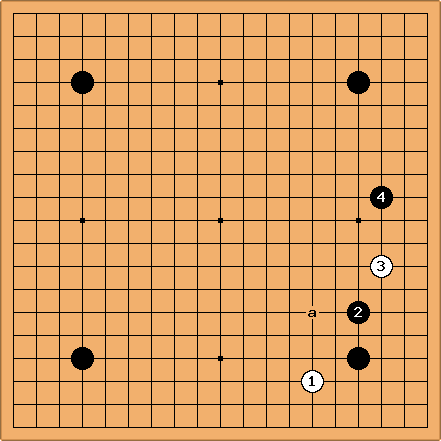 "Bearing in mind the blockade set up with Blacka-White b-Blackc, there will not be time for in the game" ("the meijin added"). tderz: dia. White gets the nice point (= ). White 21 is the invasion at san-san s.
"...Black killed a big group and scored a magnificient victory." 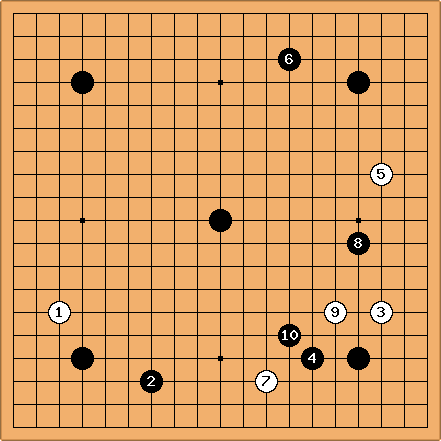 Nowadays we can get to know about these strategies from books in English from the shelf (or on Sensei's :-) ), but young Shuko had to do it by sheer will- and fighting power, not move ! 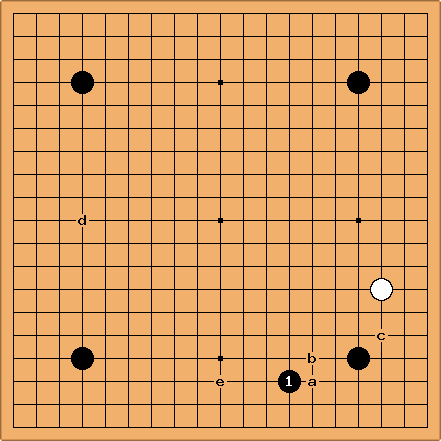 Whatever White plays - , a or b - I always want to attack with . This is an early attack. I played a series of about 13 H4-handicap games with Feng Yun, 9p, who I know from 1988 in Hamburg. I wanted to play with her at the level I want to achieve (the usual "2 stones stronger"). However, I am convinced that she could beat me easily with 6 stones (and more). Almost invariably I attacked as above. The only time I omitted it was in this position, "when she had me through" :-), but accord. to Feng I could have played = as well. Of course I lost this game (not accord. to ; I lost all the others as well :-), but one (which was a gift for "10 years marriage" (B+3.5, I remember); I mentioned that one gift is enough and I rather learn by losing), lost one H3, won clearly an H5). One time I asked her "with how much % of effort are you playing right now? ", Feng replied "80%" this rankled a bit in my 3dan's mind so I could not stay taciturn and replied "haha, me only 75%" (whereas actually I tried 99% every time). Klaus: Maybe Black jumpled out at a after ? In my oppinion, this is a little slack. The ikken tobi is alredy stable enough, so black migh attack at instead of jumping out. 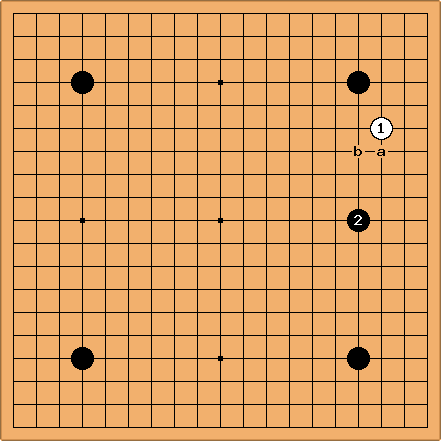 Klaus: White will probably jump out at , and now, after inducing this move, black can jump himselve, in order to move out and separate white. is still weak, and con completely settled, the upper right might later be turned to territory. Black seems to be doing fine here. Charles: This was asked recently on rec.games.go. I believe that here is best; though it would be hard to criticise a, b or c convincingly. Bill: I like d, myself. :-) e is not bad, either. White then had the nerve to say: "How do you expect to learn anything playing this crap?" FilipVanderstappen: Truly, I cannot follow white's reasoning. His play is clearly too slow and his last move is obviously very bad. I cannot find anything wrong with B's play. It is quite reasonable (and in this position actually very good) to tenuki after having played the kosumi.Only I would prefer for B's last move to be maybe a shimari but that is a minor issue. The position is clearly lost for white (even taking the handicap into account). With all due respect to W, I think his irritation (apparently) clouded his judgment. Charles: is small-scale, and plain small. 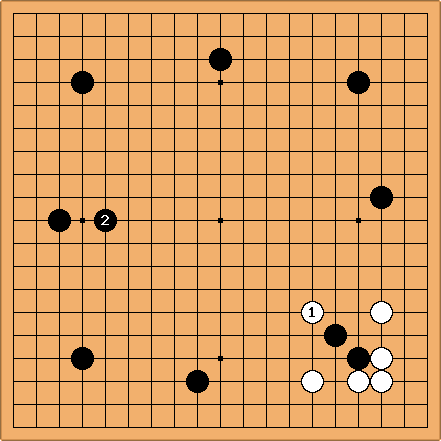 zinger: In addition, white spends two moves, and , to connect his two approach stones, when just one, at the 2-2 point, would do. RafaelCaetano: I don't understand why would a 3d would play . 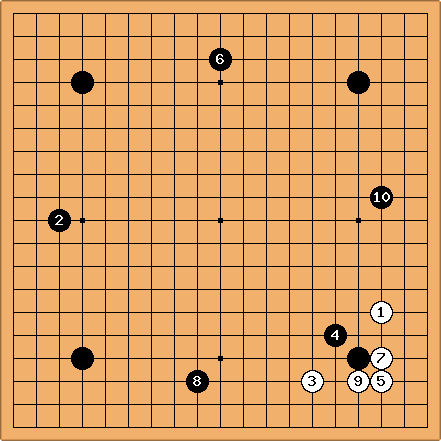 It looks like a double-digit move, capturing 2 non-cutting stones when there are a lot of big moves on the board. Am I missing something? PurpleHaze: I believe he was just irritated/provoked by my continual tenukiing. I still am not convinced that my play was correct, perhaps I should have played at 7 or 9? White here fancies himself as a great teacher, his justification for remaining at 3d for two decades. His style is to quickly play "good shape". Most of my wins came from out reading him. Though, my most memorable win came in a 3 stone game where there were no fights yielding an immense amount of territory, I won 115 to 105! Charles Although myself sometimes irritated by pupils (and a 3 dan), I lack sympathy for White here. Fhayashi I think the 3-dan here inadvertantly gave PurpleHaze a very important lesson in tenuki... If the game was posted without explanation, it would look like black is teaching white a lesson in looking at the whole board. uurtamo It looks to me like white was trying to provoke a fight and got frustrated with the fact that he was getting further and further behind with each move. [1k] This reminds me of a game in Kage's Secret Chronicles of Handicap Go, where a 4D took four stones against Yokoyama 5P, and played similar Tenuki. He said, "Look at the way I zipped around the board; that was a fast opening," and Yoko, unlike this arrogant 3D, said, "It is as you say; it looks almost like I gave you 8H." Of course, Yoko didn't play as many moves in one corner, esp. the bad 11.